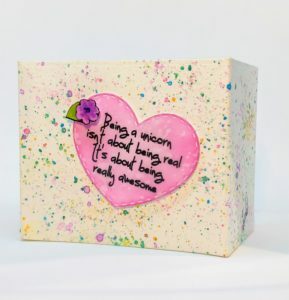 I am over the moon for the new stamp set, Unicorn Farts, from Beth Duff Designs! The images are so cute; I just couldn’t wait to start playing with them. For my first card, I decided to make a shadow box pop-up. I used a die set from Lawn Fawn to cut the frame from watercolor paper. Inside, I stenciled yellow sun rays and spritzed on a little water to lift the color. Outside, I flicked on watered down ink in rainbow colors. I used Distress Oxide inks for both sides. To cut the struts, I used the cloud edge die from Concord & 9th. I also cut a few clouds from vellum for added texture and dimension. My unicorn images were stamped in Copic friendly ink and colored with alcohol inks. I fussy cut them with my Scan ‘N Cut. I used strong adhesive, foam tape and a few thin acetate strips to put the card together. Every card needs a space to add a sentiment, so I added a die cut heart to the back for mine. What do you think? 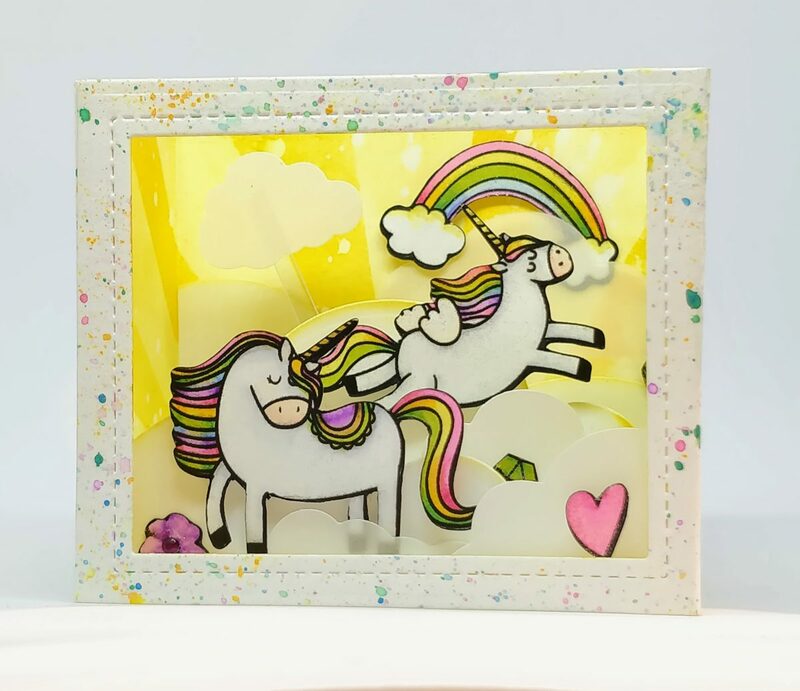 Have you made a shadow box card yet?